The day before we headed south to Perth to circumnavigate Herdsman Lake and see the amazing bird-life there we did a short drive out of town at home in Broome. 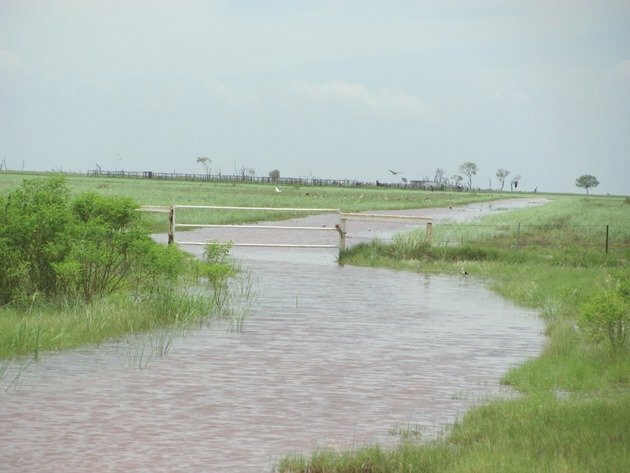 There had been a lot of rain in recent weeks and the highway south and north was flooded. The road north was closed beyond a certain distance, but the road south remained open and always offers excellent birding opportunities when this happens. 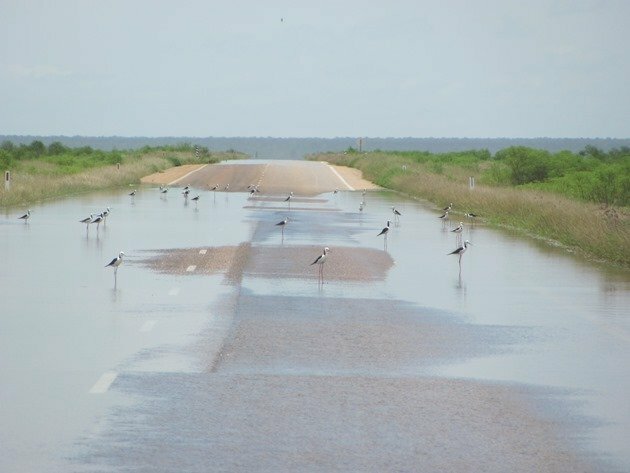 The road normally goes under water at this time of year, but remains open so long as it stays fairly shallow and if you drive in the middle of the road the camber of the surface means it is the shallowest section. The road is now in a bad state of repair from all of the traffic and they have put speed restrictions on it and will need some serious repair work once the water has fallen back off it. We always travel this section of road at slow speed anyway, because it has such a variety of bird-life. We had unseasonable rain last June and this area was flooded and a huge variety of birds appeared in the area. It was our second trip out on this piece of highway this year and sadly the second deceased Barn Owl. Unfortunately we have only ever seen dead Barn Owls in the Broome area and one day it would be nice to see a bird hunting over the land. Grass Owls are also present in the area, but remain off our bird list. We have seen and heard Barking Owls when camping in the bush and maybe one day our luck will change! 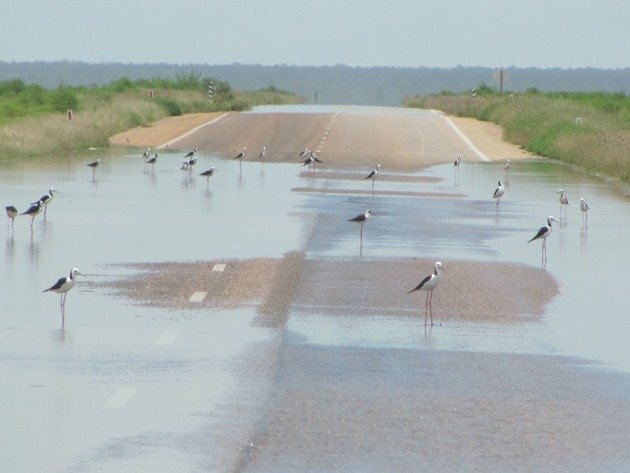 The road was under water in three sections and the Masked Lapwings and Black-winged Stilts were using the clarity of the water over the sealed road and the lack of hiding places to their advantage. 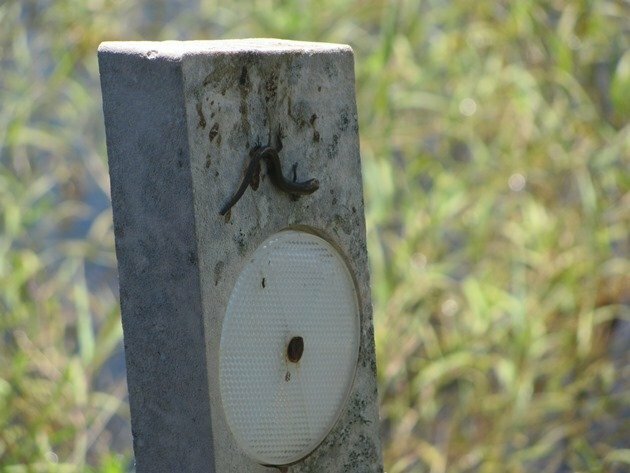 With the first rains we get mass frog breeding events and the flooded land is covered in tadpoles. The tadpoles tried to cross the road and the birds were feasting on them. Thankfully the Cane Toad has not made it to Broome yet, but with these flooding rains each year it won’t be too long before we receive the horrific pest. Black-winged Stilt holding their ground! 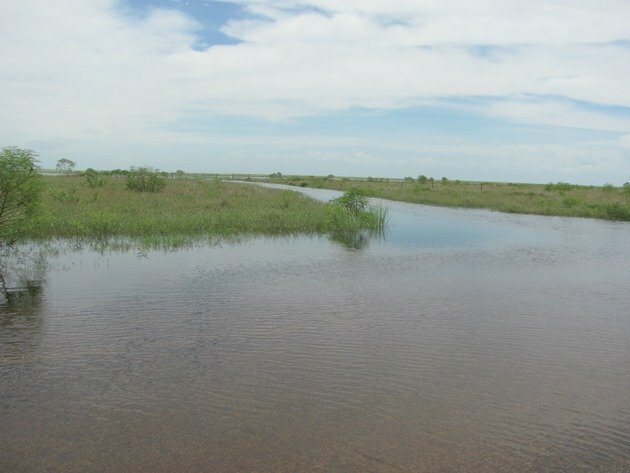 All the tracks onto the station property were underwater and all of the Brahman Cattle have moved to the highest ground that they can find. In fact it is not just the cattle, but all of the creatures have moved into bushes and trees. If you want to find out what reptiles and snakes live in the Broome area then it is a good time to go wading and see what is in the bushes! You can just look on the signs on the edge of the road for any creatures looking for dry areas! As we approached the Masked Lapwings and Black-winged Stilt they were reluctant to move and they literally circled over our vehicle and then came back down to continue feeding on the road. 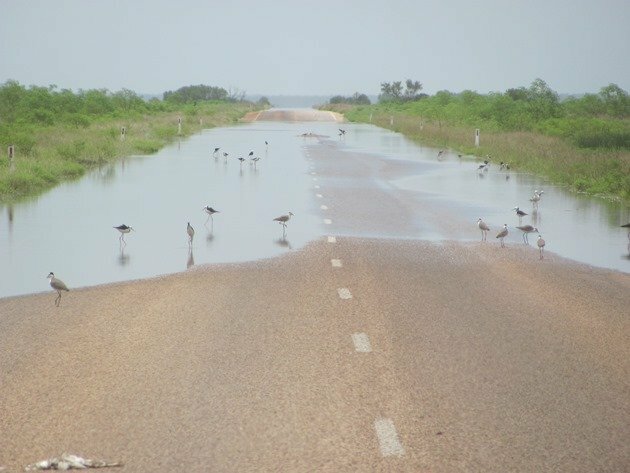 At the far end of the flooded section of highway another station track is completely flooded and a variety of birds could be seen stood among the tall undergrowth. Plumed Whistling Ducks, Wandering Whistling Ducks, Grey Teal, Pacific Black Ducks and Hardheads are prolific and Whiskered Terns fly low over the flooded land. A Swamp Harrier and Black-breasted Buzzard soar down on the flooded land looking for food along with numerous Black Kites. There were Straw-necked and Glossy Ibis wading around in the shallower water and Great Egrets and White-necked Herons were also feasting on the tadpoles. 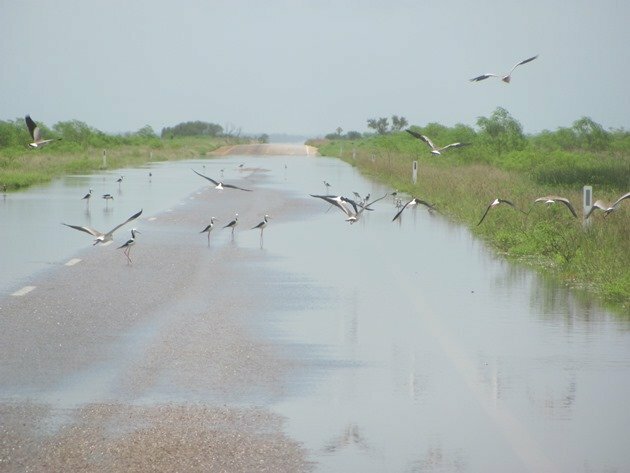 This area of flooded land right across the main highway to the south of Broome is a birders paradise and even a non-birder cannot avoid but notice the spectacle of birds. The water level has risen even more over the last two weeks and this weekend sees it now covering the road in four long sections. 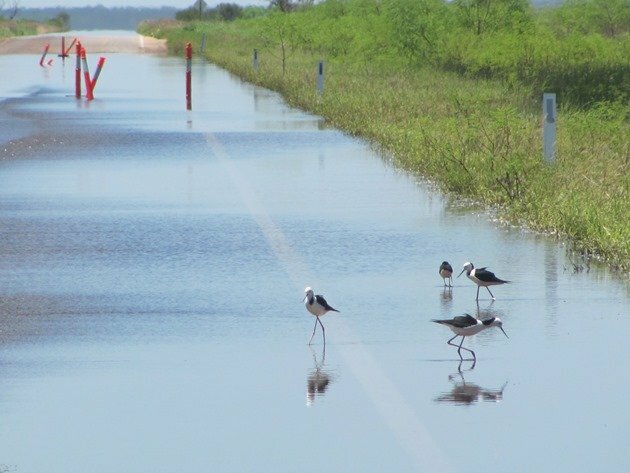 The Black-winged Stilts now have orange emergency cones to work around! 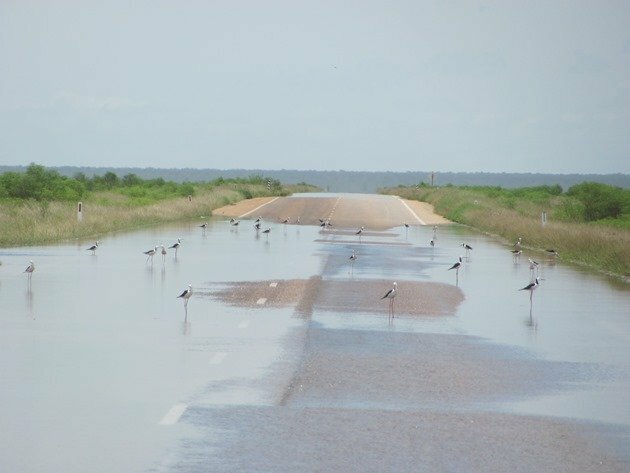 We will no doubt have a few more months of excellent birding along this flooded highway, which is good news when all other unsealed roads are closed!